The homes where two of televangelist Joyce Meyer’s grown children have been living free of charge are up for sale: The price for both together – $2.55 million. On June 19, 2005, the St. Louis Post-Dispatch published corrections to this story. The homes are two of the five homes that Joyce Meyer Ministries bought for Meyer and her four married children and their families. 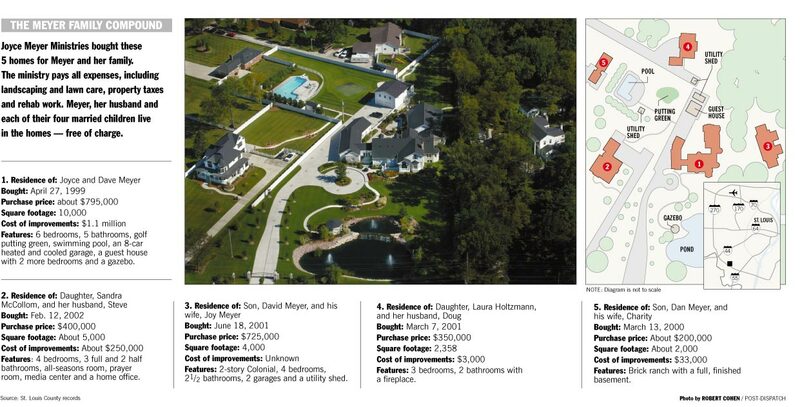 The two for sale are situated on either side of the house where Joyce Meyer and her husband, Dave, live. The Meyer family members have been living in the homes, but the ministry pays the bills – property taxes, utilities and landscaping and renovations made to family members’ personal preferences. The ministry also pays the salaries of Meyer, her husband, the four children and their four spouses, who all work for the ministry. Joyce Meyer, her husband, and their four children all serve on the board of directors that makes financial decisions for the ministry. Mark Sutherland, spokesman for the ministry, said that an increase in property values in the area of south St. Louis County where the homes are led Meyer and the ministry to put them on the market. The other three may also be sold, he said. In November 2003, Meyer told the Post-Dispatch that the ministry bought the homes, clustered near Gravois Road and Interstate 270, for her protection. The homes where the children live surround Meyer’s home and served as buffers against stalkers, Meyer said at the time. Wall Watchers, the North Carolina-based watchdog group that called on the IRS to investigate, is watching the sales. Kris Moore, spokeswoman for the IRS regional office, said she could not comment on any specific case. After the ministry bought Joyce Meyer a home on Gravois for $795,000 in 1999, Meyer gutted it and made at least $1.1 million in improvements. While Meyer and her husband, Dave, ordered the work to their personal specifications, the bills went to the ministry. In June 2001, the ministry paid $725,000 for the home next door on the west side. Meyer’s son, David, and his wife, Joy, moved in and began ordering improvements to the 4,087-square-foot home. They also billed the work to the ministry. The couple lived there free, and the property taxes, power, sewer, water and landscaping were paid by the ministry. In February 2002, the ministry paid $400,000 for a house on the other side of the home where Joyce Meyer lives. Meyer’s daughter, Sandra McCollom, and her husband, Steve, had the home torn down and built a Victorian-style, 3,557-square-foot house in its place. The ministry was billed for the house, which the coupled moved into in 2003. The ministry bought two other homes located behind Joyce Meyer’s house for her other two children and their spouses. The ministry paid all of those bills, too. Meyer has said her family was too busy working for the ministry to keep up with home maintenance. About three weeks ago, the ministry put the home where Dave and Joy Meyer live up for sale at $1.25 million. The listing boasts an “awesome” kitchen, breakfast and hearth room addition. The walls in one of the four bedrooms features a mural of Busch Stadium and the Arch. The ministry is also selling the home where Sandra and Steve McCollom live for $1.3 million. The listing describes an 11-room home with three sets of glass French doors, cherry wood floors, 10-foot ceilings and countertops made from DuPont’s Corian. Sutherland said the ministry would not provide the two couples with houses, but would not say if the ministry will give them a housing allowance in addition to their salaries and benefits. Federal law requires that the proceeds from the sale of the homes be returned to the ministry. Rod Pitzer, Wall Watchers’ tax expert, says that the move to sell the homes is “a step in the right direction.” However, he said since the ministry’s board is mostly family members and it won’t open its books, it will be hard to make sure the money returns to the ministry. “They need to separate the family from the ministry board so it doesn’t continue to look like a family-run business,” Pitzer said.